Occasionally entertaining, this wacky comedy is over-the-top, bizarre and even a little dark. It's supposedly all in good fun, though that's sometimes questionable here. by Kozo: Tony Leung Chiu-Wai and Kent Cheng are King and Fatty, a couple of nice-guy thieves who steal from the rich and sometimes give to the poor. 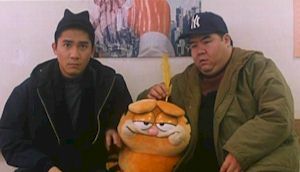 They're hired by a drooling bad guy named Cheap Chan (Anthony Wong) to steal a stuffed Garfield from a locked mansion, but child ghost Siu Bo (Siu Pak-Lam) is guarding the stuffed toy. It seems Siu Bo was the nephew of Cheap Chan, who kidnapped the boy to extract a ten million dollar ransom from Bo's parents. Sadly, Siu Bo accidentally got a glimpse of his kidnapper, so Cheap Chan killed the kid. That's right, Cheap Chan is not only a drooling loony with a screwy name, he's also a child murderer who did the deed by suffocating the boy in a trunk full of stuffed animals. And this is supposed to be a comedy. When the truth is known, King and Fatty immediately decide to help Siu Bo exact his revenge, which will put him in line for a much-desired reincarnation. Thankfully, Bo's cousin (Song Nei) and ultra-distant cousin (Yuen King-Tan) are willing to help too, but there's a price. Because of their exposure to Siu Bo's spirit, the two kindly thieves are in danger of having their life-force sucked away. They still want to help the kid despite their personal peril, but Cheap Chan hires a wacky ghostbuster played by John Sham to help exorcise the kid. Wacky hijinks ensues. Strange metaphysics permeates this Johnnie To comedy, and much of it is weird and unexplained. That's actually rather normal for a early nineties comedy, and To had yet to develop a more refined comedic touch. The result is a film that revels in its own pronounced silliness, and is filled with lots of overacting, and comedy that makes little sense. Still, the proceedings carry an occasionally entertaining glee, the conflicts are decently drawn, and the performers are likable enough. This really can't be called a good film, as it's too uneven and just plain strange to rate as anything other than a minor curiosity, but it's not entirely unfulfilling.